Hope Studios: Why Don't You...Cut the Bottom of Your Pumpkin? 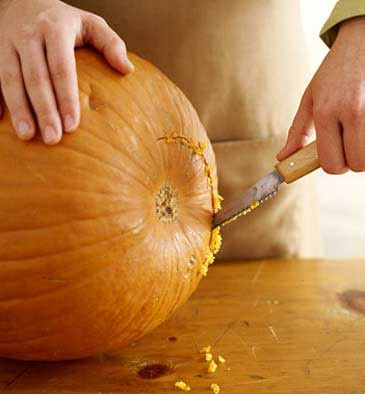 Why Don't You...Cut the Bottom of Your Pumpkin? Consider cutting a hole in bottom of your jack o lantern this year. The pumpkin will be more stable and easier to carve AND your candle will sit up easily on the smooth surface. Simply place the candle on the ground and place your carved jack o lantern on top! You know, I saw this on some Food Network (I think) challenge when they brought in three pumpkin carvers to compete. I was in awe at how brilliant this was - and why didn't I ever think of it?! totally brilliant! I am going to do that next week when we finally get around to carving the pumpkins! So, no icky stuff comes leaking out, does it? Because if not, I'm totally going to try it. I think you also need to cut a vent hole in the top. That's what I've done when I cut the bottom out. Yes, makes so much more sense!! Hmmm... why didn't we ever think to do this? You realize we're all going, duuuuuh right now, right? I carved a stinkin' rotten pumpkin. I think it got frosted and we had to make a jack o lantern so I just forged ahead. ahhh...now why didn't I think of that?